Advertising and marketing was a field wherein strategies were drawn based on attracting mass audiences of people into buying products. This was just about selling products though, much of the creative processes were also drawn up keeping betterment of the human race in mind. And everything was done either for the print mediums like newspapers, magazines and newsletters or for television and radio. But since the dawn of the internet things have changed quite drastically. You can look at it this way – The same rules that applied for print, radio and television applied with internet and digital marketing too, but the target audience got clipped into a range of different sub groups and categories. And this is what defines the digital marketing scenario of today. In fact, this is the optimum usage of creativity and resources for a social media marketing strategy. 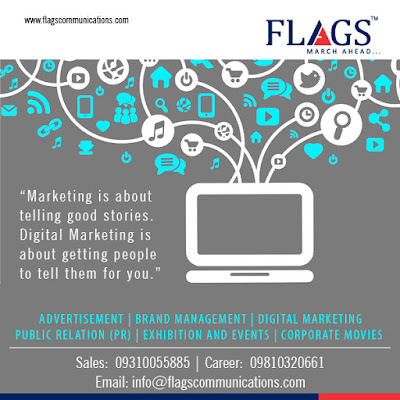 This brings us to Flags Communications – an INS accredited and one of the top digital marketing agencies in Delhi. Within a span of a decade, digital marketing has boomed much like how the world saw a second coming globalization during the early 1990’s. But this time around, with the rise in social media users, the concept has rightfully captivated the advertising and marketing world to the extent that social media marketing is the priority for most digital marketing agencies around the globe, so much so that the use of traditional mediums of marketing such as newspapers, radio and TV has gone down significantly. The world is going digital, everything has gone virtual now and Flags Communications is proud to spearhead the movement as a digital marketing agency in Delhi.